The TRAD TKO Boxing Gym, has had a busy start to the new season, both fight wise as well as in the recruitment of the next generation of stars for the famous East London fight factory. In September alone there were twenty of the TRAD TKO squad in action, with no less than seventeen taking the victors laurels - on the Championship trail both Commonwealth Middleweight Champion Billy Joe Saunders and English Light Middleweight Champion Erick ‘The Eagle’ Ochieng successfully defended their crowns, whilst Light Welterweight Danny ‘Cassius’ Connor and Featherweight Ian Bailey secured Southern Area titles. The only flaws in the Championship campaign came by way of a rather dubious, close points loss for Peter McDonagh, on his attempt to become a three weight Southern Area Champion against Bradley Skeete and ‘Mighty’ Kevin Mitchell’s failed attempt to become WBO Lightweight World Champion, against Ricky Burns. On a brighter note, the TRAD TKO’s stable of youngsters proved to be in stunning form, with rising stars Wadi ‘Machoman’ Camacho, Joel McIntyre, Frankie Buglioni, Tom Baker, Charlie Hoy, Gary Corcoran, Billy Morgan, Ediz Hussein, Tommy Watson, Frankie Monkhouse, Eren Arif, Brett O’Callaghan and female star Areti Mastrodouka all securing excellent wins. The only blot on the young stars copy book came by way of Menay ‘The Emperor’ Edwards’ close points loss to Neil Dawson, following a fantastic barnstorming all action bout, that had the fans on their feet from start to finish. With news beginning to filter out that the TRAD TKO are about to launch their own promotional arm - TKO Events International - which will be promoting events in the UK, Southern Ireland, Malta and the United Arab Emirates in 2013, Johnny and the team have been busy recruiting future stars to their stable. With the first of these new youngsters in action this coming weekend Johnny took a little time off from coaching duties to talk about the latest signings. “I’m pleased to announce some new signings for the TRAD TKO gym this week, we’re calling them the Six Gs, I’m calling them the ‘Gs’ because they are the new generation. Start off with young Tommy Martin, only eighteen years of age, from Cambridge. Fourty odd fights in the Amateurs. A gym kid really, he always wants to be in the gym, he loves being in the gym. Very good learner, been with us four weeks now, he’s improved immensely in that time. If he had his way he’s live and die in the gym, but we’ve got to keep a short rein on him and make sure he’s only in here the time we need him in here. Looking forward to his debut, on November 18th, at York Hall, on Miranda Carter’s show. Then we’ve got little nineteen year old Joe Stevens, who looks about fifteen. He’s a great little stylist, needs a little developing, but we’re pleased to have him on board and we’re going to move him on very slowly because he’s a little bit down on man strength at the moment, but I feel me and Barry (Smith) are doing a really good job with him. Then we’ve got ‘Paddy’ Paul Quinn. Great fighter, really really good fighter. Been a Pro, in Belfast, about a year now, but for some reason he didn’t get any fights. Been with us a few months now, again he’s improved immensely since being with us. 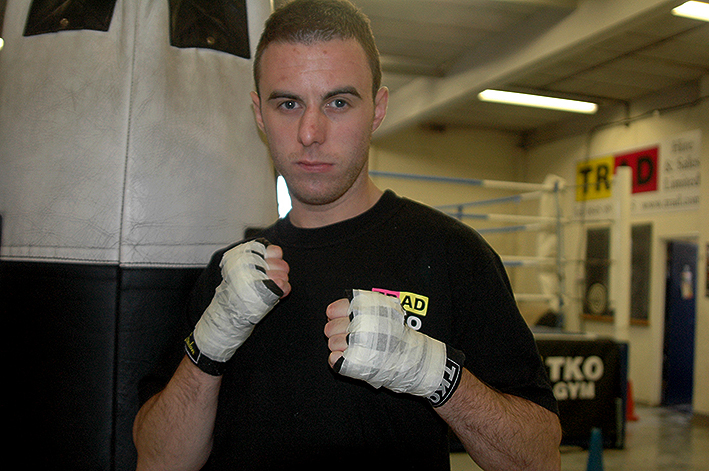 He debuts this coming Saturday in Belfast, on Alio’s (Wilton) show, and we’re all looking forward to seeing him fight. Then we’ve got a Turkish connection, Onder Ozgu. He’s had over a hundred fights in the Amateurs, he’s a Light Heavyweight and they call him ‘Little Mike’ in Turkey, because he has a similar style to Mike Tyson, believe me this kid can fight like Tyson. We’ve just got to sort his visa out before we can turn him pro, hopefully that will all be done in the next few weeks. I’m sure that within the next four to five weeks we’ll see him fighting in front of a large army of fans. I had one Turkish fighter before, Gurkan Kazaz, he used to sell three hundred tickets, this kid’ll sell more. We’ve got him being trained by Turkish, former Commonwealth Champion Mo Hussein, which solves any language barriers. I think Onder will be a promoters dream, because he can fight and he’ll also bring a big army of fans, this kid is gonna be big. As well as signing Onder, we’ve also taken on board his younger brother, Shiya, who’s only eighteen years of age. He’s a very experienced Amateur fighter in Turkey, originally he came to us to turn pro but because we now have our own Amateur club - TRAD TKO ABC - which is run by young Terry Henry, what we’re gonna do with Shiya is give him half a season in the Amateurs, so we can get a good look at him because at eighteen years of age he’s still a baby, is have him fight Amateur for six months for the TRAD TKO ABC and then turn him pro after that. Staying international, we’ve also just signed Albanian Middleweight Festim Lama, he’s been kicking about here at the gym a little while. He used to box for Repton, he’s a proper character, tough as old boots and he’s a throwback to the old school of fighting, just wants to fight. He’s only had nine amateur bouts, but I spoke to Stevie Bunce, who actually see him box in the Haringey Cup. Steve said the kid can really fight. He sells a few tickets as well, there’s a big Albanian community over here. Again I’m looking forward to working with him. He’s a little bit of a rough diamond at the moment, but we’ll polish him and have some exciting times with him. Finally we’ve signed Andy Gatenby, actually signed him a month ago, but had a little bit of a problem with his brain scan, but it turned out to be not a problem, so it was a problem that never was. 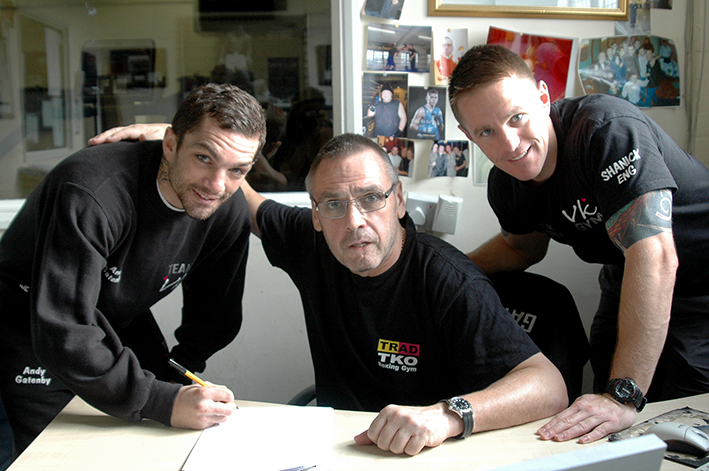 That’s all sorted now, young Andy Gatenby, trained by John Murray down in the Viking Gym. He comes up for regular sparring, he looks to be a very good fighter. Andy’ll be making his debut in mid-November in Portsmouth, on the Pier, so we’re all looking forward to seeing him make his debut. Don’t forget, any boys out there who are unattached or looking to go pro, we give anyone a two weeks trial, just call the gym or call myself and we’ll fit you in and have a look.